In addition to our full line of decorative banner brackets and hardware, Banner Up!™ also offers a variety of banner stands to choose from. No matter what stand you select, you can be sure your banner will be both beautiful and long-lasting. 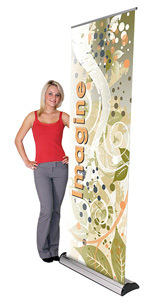 We offer a nice selection of banner stands that are great for single-sided, double-sided or backdrop displays. Premium single-sided cassette banner with features that include a telescopic pole and ratchet graphic tensioner. Includes a molded carrying/storage bag. Purchasing additional cassettes allows you to build a library of different banners that can be switched out as needed. 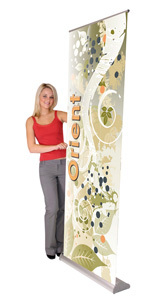 Budget friendly and simple to use, the Orient combines elegance with excellent value. Finished in anodized Silver with heavy duty molded end plates, includes a padded carrying bag. A double-sided version of our top seller! Finished in Anodized Silver with heavy duty molded end plates. Padded carrying bag included. 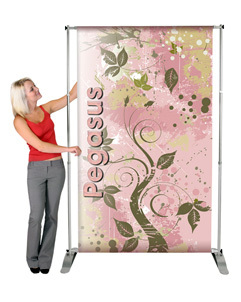 A fully adjustable telescopic banner stand, the Pegasus makes an excellent, budget friendly backwall or backdrop that can be used as a single or double-sided unit with dual telescopic poles. • Width is adjustable from 52.5—95″. • Height is adjustable from 36—96″. • Width is adjustable from 27.5—48″. • Height is adjustable from 36.5—96″. This premium quality, single-sided banner stand with refined styling, features a graphic tensioner, sleek profile and quick change graphic system. 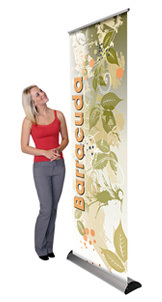 Banner stand comes complete with a telescopic pole and EVA molded carrying bag.